For those people who suffer from high blood pressure, a blood pressure monitor isn’t just a piece of essential medical equipment; it is a necessity. Because the lifestyle and diet can affect the patient’s blood pressure anytime, so keeping a blood pressure monitor on hand can provide practical health assistance. Such equipment can help the patient get accurate blood pressure readings anytime and anywhere. 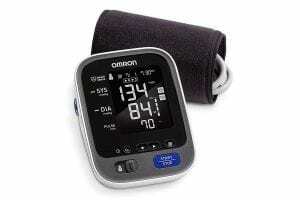 When it comes to blood pressure monitors, Omron is one of the most popular and favorite brands that most patients opt for. Known for its accurate reading, portability, user-friendly program, and high-tech system, Omron indeed is reliable medical equipment that won’t also break your bank. 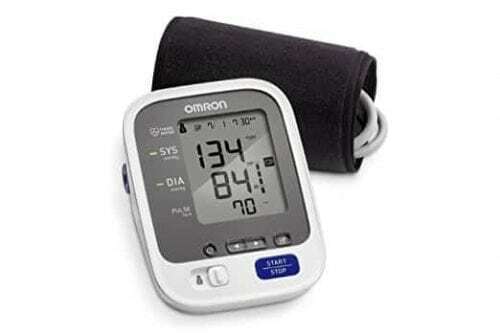 If you are looking for the best Omron blood pressure monitor that will suit your medical needs, our list of the Top 10 Best Omron Blood Pressure Monitors will guide you through. 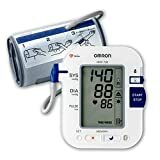 If you are still looking for the best Omron blood pressure monitor to be your reliable health assistant, our top ten list will help you the one that suits you. Check out the best-selling picks! Those who are using a blood pressure monitor for the first time might find it a little difficult or confusing to know how it works; if the blood pressure’s too high, low, or normal. That’s when the Omron 7 series becomes very handy. It features a multi-color indicator that shows if your blood pressure readings are in the normal range or not. It goes green if the reading says it is normal, but the orange color indicates otherwise. This equipment also features a BP level bar that shows the comparison of your blood pressure readings to the normal rate. This can be very helpful for those who need to maintain their blood pressure rate at a normal level. The cuff size, on the other hand, is an Easy-wrap Comfit that fits medium to large arms. 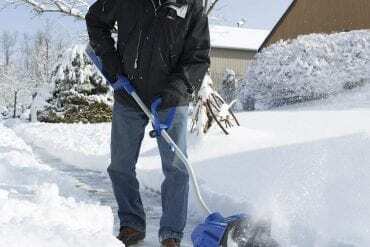 It inflates around the arm to prevent incorrect cuff positioning. If you want to keep track of your readings, this blood pressure monitor has a 120 memory storage that allows you to review your previous measurements according to the time and date. Although automatic blood pressure monitors have become widely used over the years, a lot of users still prefer to stick with the traditional way – using an inflation bulb. If you prefer the manual process, Omron has come up with a manual blood pressure monitor that will definitely suit your needs. 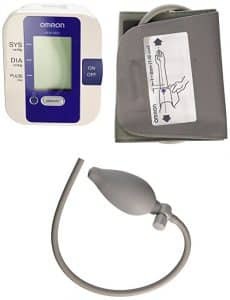 The HEM-432C manual blood pressure monitor includes an inflation bulb that you can use to check your blood pressure manually. You just have to rapidly squeeze the bulb until it reaches the about 30-40mmHg higher than your normal systolic reading. It is pair up with a blood pressure monitor with a digital panel where you can see all the blood pressure readings. It can even show your pulse rate as well as the previous readings through the memory storage. The Omron 3 Series features a one-touch operation that allows the users to check the blood pressure in an instant. It has a large digital panel that shows the blood pressure readings in large digits. Users, especially the elderly, can truly benefit with this feature making it much easier for them to read the results. Another outstanding feature of this automatic blood pressure monitor is its ability to detect irregular heartbeat while you’re checking your blood pressure level. Once it detects an irregular heartbeat, it will notify you through the indicator icon. It will alert you which allows you to consult your doctor immediately. And if you want to review your last 14 readings, you can check it with just one push! For those who have large arm sizes, you need a larger cuff before you take your blood pressure reading. Using the right size of cuff provides better comfort and prevents the tendency of getting inaccurate readings. 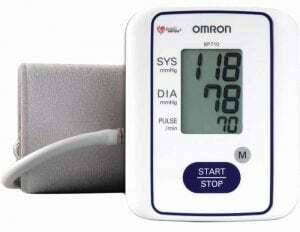 If your arm is at 13 to 17 inches, this Omron blood pressure monitor is the one for you. Just like the other Omron blood pressure monitors, this unit is clinically validated to provide accurate blood pressure readings. It uses the IntelliSense monitor that inflates the cuff to the ideal level every time you use it. 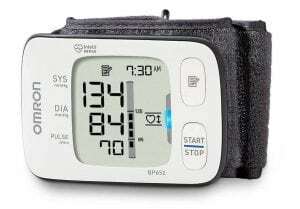 It features a large digital display that shows the blood pressure and pulse readings. With just one push, you can start the process. The memory storage also allows you to check your previous blood pressure readings if you want to compare them to one another. If there’s another blood pressure monitor that features the IntelliSense technology, you better check out this HEM-780 model from Omron. This technology inflates the cuff to the ideal level where you won’t have to make any adjustments to change the inflation level. This is beneficial for those hypertensive patients who have arrhythmia or heart disorders as their blood pressure rate may vary from time to time. Apart from its ease of use, it also provides superior comfort. This automatic blood pressure equipment is portable which allows you to take your blood pressure readings at home or whenever you need to. It has a large digital display where you can see the detailed readings of your blood pressure and pulse rate. But if you want to keep track of all your readings, this model has a total of 200 memory storage! It includes the previous readings together with the date and time. If you’re looking for another Omron unit that detects the irregular heartbeat and provides accurate readings, consider this Omron 3 series. It is also designed with a cuff that fits standard and large arms. And since the cuff is contoured, it provides superior comfort while getting your blood pressure measured. It fits 9 to 17 inches. This best-selling blood pressure monitor functions with just one push allowing the patients and other users to check their blood pressure level easily. It also detects irregular heartbeats and alerts you through the indicator icon. This helps you to keep track of your medical records and inform your physician right away if there’s any health risk. The 14 memory storage is also a useful feature that you can use as a basis for a blood pressure reading comparison. 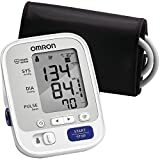 Omron 10 series is one of the latest units of blood pressure monitors that features an incredible technology that can truly be helpful when checking your blood pressure level. Unlike the other versions of the Omron monitors, the 10 series is engineered with a True Read Mode that displays three consecutive readings and the average rating of the three readings. It also detects irregular heartbeats that allow you to check if there are any other health issues. 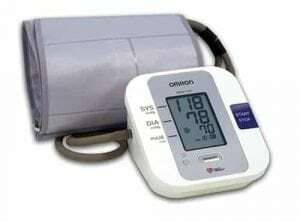 This blood pressure monitor is proven to be accurate when it comes to the pulse and blood pressure measurements. Physicians even use this equipment to check their patients’ blood pressure and even recommend to those who need to have their blood pressure reading checked now and then. It is portable, very easy to use, and reliable. It also enables you to compare your previous and current readings if there’s any irregularity in the 200 memory storage. 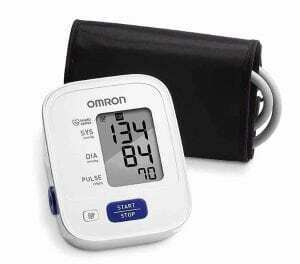 The BP742N 5 series is among the best-selling Omron blood pressure monitors that are recommended by many health professionals and doctors due to its accuracy. It comes with a BP level bar that tells you the normal blood pressure levels and compares them to your readings. This feature can be of great help for those hypertensive patients with blood pressure levels that likely fluctuate. The Advanced Averaging records the three consecutive readings within the last 10 minutes and provides the total average. When it comes to the cuff size, it can fit 9 to 17 inches. It is designed with a contoured body for a more comfortable measurement. It also has an indicator for the irregular heartbeat which notifies you right away so you can inform your doctor about it. And to let you review the previous results, it has 100 memory storage that shows previous readings with date and time stamp. If you want to venture on another type of blood pressure monitor for home use or whenever you need to check your blood pressure, the Omron 7 series wrist blood pressure monitor is a must-try. Not only is it innovatively created and highly portable but also reliable with its precise blood pressure and pulse readings. Physicians and health professionals even recommend this wrist blood pressure monitor. This portable equipment inflates automatically when the wrist is at the heart level and in the correct position. If you want to make sure you’re in the correct position before you take your measurement, it has indicator lights that will guide you through. The operation is silent and quick! You can definitely take your blood pressure measurements anytime, anywhere. 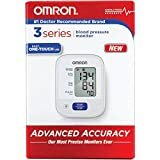 Just like the other Omron blood pressure monitors, this one also has a BP level bar that differentiates your readings to the normal range of blood pressure. Although it is sleek, small, and portable, it functions with immense features and stores 100 memory blood pressure results that you can compare and review! Taking the first spot on our list is the latest Omron blood pressure monitor unit and one of the widely purchased units on the market. This Omron 10 series is loaded with stunning features that jive in with the modern technology without compromising its accuracy and reliability. It is engineered with a Bluetooth connection that integrates with your smartphone, tablet, computer, or any device that is applicable with Bluetooth. As it is also integrated with an app, you can keep the records on your computer or send them to your doctor through email. It can store 200 readings that you can check and review for comparison. When it comes to the precise readings, Omron ensures you get the most out of your readings. It has multi-indicator lights that tell you if your rating is in a normal range or hypertensive. Green means normal while the orange color indicates hypertension. You can see the results through the large easy-to-read digital display. It uses an Easy-Wrap ComFit cuff to prevent incorrect arm positioning. READING ACCURACY: The most crucial attribute of a blood pressure monitor is the accuracy in reading. It is the major reason why you’re buying a blood pressure monitor in the first place. Look for labels and details that it is clinically tested or validated which indicates that the equipment had gone through a series of tests before it became available on the market. The product’s authenticity will assure you that the blood pressure monitor is tested and proven to provide accurate and reliable results. However, if you’ve overlooked these details, you can still check whether the equipment is reliable for blood pressure readings or not. You can jot down the readings you get from the blood pressure monitor and compare it to your doctor’s readings the next time you visit for a check-up. CUFF SIZE: The cuff or the part of the equipment that you wrap around your arm comes in different sizes. Using the right size of cuff makes the blood pressure reading more accuracy. It’ll also provide you better comfort while getting through the process. That’s why you should make sure you have the right size of the cuff. Otherwise, there’s a tendency you’ll get an inaccurate reading. It shouldn’t be too tight or too loose but rather provide a snug fit. DIGITAL DISPLAY: Blood pressure monitors are designed with digital display screens where you can view the readings or the measurements of your blood pressure. It is important that you can clearly read the details right there and then for you to record the accurate medical information. These Omron blood pressure monitors are designed with an easy-to-read backlit display with extra-large digits for much clearer display. Pick out the one that’s very comprehensible and readable. DEVICE INTEGRATION: As these monitors are innovatively engineered with modern technology, you can now integrate the blood pressure monitor with your smartphone, computer, or tablet. You can integrate it with an available app and keep the records on your device. This will also be a very convenient feature for those patients who need to update their doctors or medical assistant with their regular blood pressure reading. Choosing a blood pressure monitor can truly be a lifesaver. Through the accurate readings and regular checking, you can make necessary changes in your diet and lifestyle. 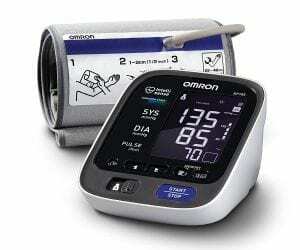 But before you can apply such changes, you need a reliable and trustworthy brand of blood pressure monitors that you can depend on to avert the risks of high blood pressure; Omron is one of the best brands you can find on the market. As you get through the huge selection of Omron blood pressure equipment, you can pick out the best one that will suit your needs if you thoroughly check the features such as accurate reading, cuff size, device integration, and the ease of use. If you consider all these, there’s no doubt you’ll find the best blood pressure monitor that you can use at home!